On the one year mark of his unjust imprisonment, U.S. Congressman, Spanish political and civic leaders call for release of Eduardo Cardet, national coordinator of the Christian Liberation Movement. WASHINGTON – Congressman Mario Diaz-Balart (FL-25) issued the following statement marking the one year anniversary that Cuban activist Dr. Eduardo Cardet was brutally and arbitrarily arrested. 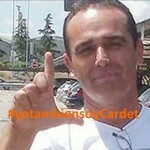 Cardet remains imprisoned by the Castro regime. “Today marks one year since the latest disgraceful arrest of Cuban activist Dr. Eduardo Cardet. Dr. Cardet is a leader within Cuba’s Christian Liberation Movement (MCL) and a physician who worked in a health center in Velasco until he was expelled due to his pro-democracy activities. According to accounts provided by MCL members, Dr. Cardet suffered severe beatings at the time of his arrest and during his subsequent detention. Human rights organizations such as Amnesty International, Freedom House, and Directorio Democratico Cubano have condemned his imprisonment. “Dr. 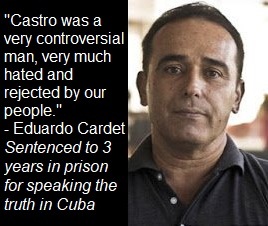 Cardet’s imprisonment highlights the continued repression suffered by those who dare to express opposition to the Castro regime. Prior to an important JusticeCuba event in Washington, D.C. earlier this month, which I attended, the Castro regime prohibited Jorge Luis Garcia Perez Antunez from leaving Cuba to personally attest to lawmakers the brutal repression that he has faced. Just this month, dozens of the renowned Ladies in White, who march in support of political prisoners and their families, were detained on Sundays while on their way to Mass. Eduardo Cardet, "the village doctor", imprisoned on November 30, 2016 for political reasons and declared a prisoner of conscience by Amnesty International, remains in crowded conditions with ordinary prisoners and sentenced to three years in a fraudulent trial for assault against an authority.His notoriety in Cuba is due to being the successor of Oswaldo Payá at the head of the MCL, the Christian Liberation Movement, which carries out the peaceful demand "One Cuban, One Vote", which is being handed out to the deputies of the National Assembly of the Popular Power of Cuba and that in retaliation has ended with its leader in prison. They are applying against Dr. Cardet treatment reserved for a prisoner in maximum security in open violation of the same penitentiary laws in force on the Caribbean island. His detention a year ago was very dangerous, as he was arrested and beaten in front of his children. In all this long period of arbitrary detention he has been under the supervision and control at all times by State Security. His family is also threatened and coerced and all of this when, according to the Cuban regime, he is only charged with a common crime of brawling with one of the police officers who arrested him. Cuba has always been a fraternal people with which we are united by great ties of blood and shared history. The release of Eduardo Cardet, who was honored last July with the Prize for Freedom of Conscience of the Peace and Cooperation Foundation, is a just cause that deserves the support of all democratic citizens. For this reason, the undersigned formulated to the Cuban authorities this petition for the release of those imprisoned for reasons of conscience in Cuba. Likewise, we ask the Spanish authorities, in coherence with the principles of defense of human rights and democracy, to do everything possible to ensure the immediate release of Eduardo Cardet and other prisoners of conscience in Cuba.